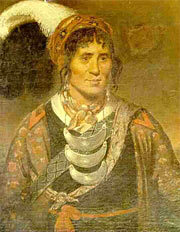 Portrait of Osceola by Robert John Curtis, 1838. The Charleston Museum, Charleston, South Carolina. "We shall not write his epitaph or his funeral orations, yet there is something in his character not unworthy of the respect of the world. From a vagabond child he became the master spirit of a long and desperate war. He made himself -- no man owed less to accident. Bold and decisive in action, deadly but consistent in hatred, dark in revenge, cool, subtle and sagacious in council, he established gradually and surely a resistless ascendancy over his adoptive tribe, by the daring of his deeds, and the consistency of his hostility to the whites, and the profound craft of his policy. In council he spoke little -- he made the other chiefs his instruments, and what they delivered in public was the secret suggestion of the invisible master. Such was Osceola who will long be remembered as the man that with the feeblest means produced the most terrible effects."